When the Science Center was built in the early 70's, a rooftop greenhouse was included in the building plan. Because of a shortage of funds, the greenhouse was never finished; only the foundation was built. Dr. Paul Tefft needed to grow soybean plants to carry out his research, and he built a wood-fiberglass geodesic dome type greenhouse on the roof in 1984. The design came from Popular Mechanics, and Dr. Tefft did all the work on the dome himself. This structure could only be used during part of the year because there was no way to heat or cool it. Several years later, Dr. Tefft got NSF funding for environmentally controlled plant growth chambers. The dome was still used to grow some plants, and as a winter home for some of Dr. McRobert's turtles, until 1995. 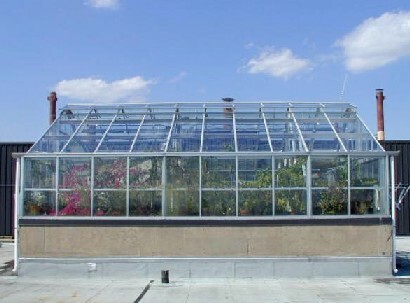 In 1996, a glass-aluminum greenhouse, with automatic heating and ventilation, was finally built on the Science Center roof. It was designed and built by Ludy Greenhouses from New Madison Ohio. Dr. Karen Snetselaar, who teaches courses in plant biology, is the main user of the plants grown in the greenhouse. However, it is also used by other members of the Biology department for teaching and research, and there is potential for wider use by other members of the University Community. Dr. Vincent McCarthy, Provost at the time that the greenhouse was built, provided funds and other support. Dr. John Tudor, head of the Biology department, also helped with fundraising and logistics. Dr. Paul Tefft, also of the Biology department, helped with logistics. Dr. Michael McCann, Biology, helped with decision-making, dealing with permit problems, midnight drives for emergency heaters, and a host of other things. Al Sgro, of Sgro Plumbing, went beyond the call of duty to help get the greenhouse built. SJU Facilities Management helped with construction decisions. The SJU greenhouse functions mainly as a place to house the collection of plants used in teaching Biology courses. There is quite a variety of non-flowering plants such as ferns and gymnosperms, that are used for the Organismic Biology course. There are representatives of many families of flowering plants, used for the Plant Systematics course. Research plants, mainly corn and soybeans used by Drs. Snetselaar and Tefft, are also grown in the greenhouse.If you'd like to take a personal tour of the greenhouse, contact Dr. Snetselaar in the Biology Department. If you'd like to take a personal tour of the greenhouse, contact Dr. Snetselaar in the Biology Department.